Includes: Titration Vessel, Detector electrode, Generator electrode, Drying tube, Carrying Case, Power Pack, Car adapter, Injection septa (10), Glass syringe (1 ml), Luer needle, Bottle of Molecular sieve, Stirrer bar, Funnel. Optimised for testing insulating oils with a specific gravity of 0.875, the Megger KF875 simply requires the operator to press one button and inject a 1ml sample into the test cell. The simple ‘one touch’ operation makes the KF875 so easy to use that it requires no specialist knowledge or training to use it effectively. 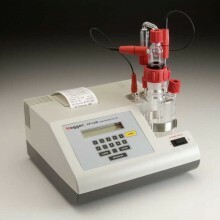 Results are presented on the instrument display and on the integral printer in both micrograms of water and in milligrams per kilogram (parts per million, ppm). The unit eliminates inaccuracies with ACE Control System - some Coulometric Karl Fischer sets are susceptible to inaccuracies due to changes in electrolysis cell resistance, which requires frequent checking of the titrator efficiency by analyzing known water content standards. The KF875 and the KF-LAB MkII remove this need by using the patent pending ACE (Automatically Compensated Errors) Control System. This guarantees that the electrolysis current produced and the count rate displayed are always correctly synchronised, regardless of changes to the electrolysis cell resistance. The printer may be disabled if not required and results can be calculated in ppm, mg/kg, % and micrograms. 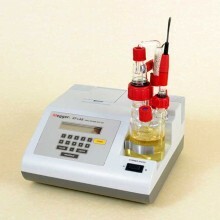 For extra flexibility, the results may be calculated based on the weight of the sample or based on the volume and specific gravity of the sample. The KF875 uses Karl Fischer coulometric titrimetry - the industry standard method for determining moisture content (ASTM D1533, BS EN 60814:1998, IEC60814:1997). Optimised for insulating oil with an SG of 0.875. Highly portable and designed specifically for outdoor use. Using the ACE (Automatically Compensated Errors) Control System. May be powered by internal rechargeable batteries or from the supply. The KF875 is designed to work with all major coulometric Karl Fischer reagents, either pyridine free or pyridine based. Titration method Coulometric Karl Fischer Titration. 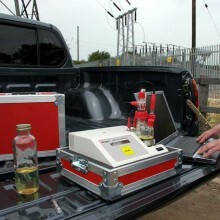 Electrolysis control Patented “ACE” control system. End point detection AC polarisation. End point indication Visual display/ print out/ acoustic beep. Type of sensor Two pin platinum electrode. Measuring range 1 μg - 10 mg water. Moisture range 1 ppm - 100 ppm. Max. titration speed 2 mg per minute. Precision 10-100 μg ±3 μg, 100 μg - 1 mg ±5 μg, above 1 mg ±0.5%. Sample ID number Not available. Print format μg + mg/kg, ppm. Data logging RS232 and results manager software. Calculation modes Volume/density, Preset values. Statistics Preset up to 99 runs. Calendar / clock Analysis time & date print out. Keypad/user controls Non tactile membrane/display prompted menu. Display 40 character alphanumeric backlit display. Printer 42 character high speed thermal printer. Power supply 90-264 VAC, 47-63 Hz 12 V DC car adapter/internal battery. Battery life 8 hours running time. Battery charging 14 hours after average use. Battery low Display & print out indication. Dimensions 250 x 245 x 120 mm. Weight 3 kg (without carry case). Megger KF875 Warranty 1 year. 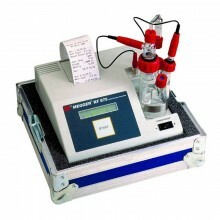 PDF Specifciations of the Megger KF875 Moisture In Oil Test Set.